Japan's asteroid-sampling Hayabusa 2 probe captured this image of Earth during a speed-boosting flyby on Dec. 3, 2015. A Japanese asteroid-sampling probe celebrated one year in space by snapping some photos of its home planet. The Japanese Aerospace Exploration Agency's (JAXA) Hayabusa2 spacecraft captured a series of Earth photos during a speed-boosting flyby of the planet Thursday (Dec. 3), exactly one year after blasting off on a mission to send home pieces of a near-Earth asteroid. You can see those images in this awesome video animation of the Earth flyby photos. Hayabusa2 is on its way to the 0.6-mile-wide (1 km) asteroid 162173 Ryugu (formerly known as 1999 JU3), and is scheduled to arrive in orbit around the space rock in July 2018. The probe will spend about 18 months at the asteroid, deploying several small landers and collecting samples that could help researchers learn more about asteroid composition and the solar system's early days. If all goes according to plan, the 1,300-lb. (590 kilograms) Hayabusa2 will depart from 162173 Ryugu in December 2019 and return to the vicinity of Earth a year later. The spacecraft will send its return capsule down to the planet's surface; it should land in the Australian outback, JAXA officials have said. 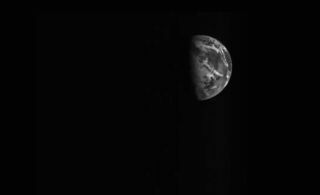 Japan's Hayabusa 2 asteroid probe captured this amazing view of the Earth and the moon together as seen from 1.8 million miles (3 million kilometers) away during an Earth flyby on Dec. 3, 2015. Hayabusa2 will build on JAXA's first Hayabusa mission, which successfully returned a small sample of the asteroid Itokawa to Earth back in 2010. Thursday's flyby was designed to help get Hayabusa2 on its way to its asteroid target, and mission officials should know soon if the maneuver achieved its aim. "After its closest flight to the Earth, we have confirmed the good health of the 'Hayabusa2,'" JAXA officials wrote in a statement Thursday. "It will take about a week to confirm if the explorer entered the target orbit."